Within the Birthright setting noble families are literally descended from the old, dead gods - or rather, from their powers. Almost 2000 years ago, the old gods met on a battlefield atop a mountain and fought against their brother Azrai, who had become twisted and corrupt with dark powers. The old gods sacrificed themselves in order to stop Azrai, and in the cataclysmic battle their powers exploded outward, killing many mortals on the battlefield and infusing the bodies of the rest with divine power. The battle continued and the first use of these blood powers led to the discovery that by slaying another person with one of these mystical bloodlines would increase their own powers. Almost all nobles are descended, in some way or another, from survivors of this battle at Mount Deismaar. In 2000 years, the bloodlines have diluted and become weak, but those who rule provinces and countries find that their bloodlines can increase. This is a double-edged sword, because the greater in power a bloodline is, the more tempting it is for another person to come and try to steal it from you - with a knife to the heart. The events of my campaign are heavily influenced by the events of World War One, hence the title of "The Great War," but only in part. While the war is not in every scene of the story, it is a constant presence within the story and around the characters. In the real world, World War One was precipitated by the assassination of Austrian Archduke Franz Ferdinand and his wife, which took place in Sarajevo by a Bosnian Serb. Without going into the finer details of why and how, Austria had a tenuous relationship with both Sarajevo and Bosnia due to past conflicts. In response, Austria sent a list of demands to Serbia which would have dissolved the country and made it a territory for Austria. Amazingly they agreed to all but one of the conditions and Austria used that as an excuse to invade. Soon every other country in Europe was lining up allegiances and enmities to help sway the conflict in one way or another, and within a few months everybody in Europe was at war with one another. Many of the countries in this fantasy world have past histories that make for already existing alliances and rivalries. Diemed is a theocratic monarchy, the state religion worships Haelyn through the Orthodox Imperial Temple and is ruled by Baron Heirl Diem. A thousand years ago Diemed spanned across all of southern Anuire, but as it's fortunes waned the country of Roesone and Ilien grew up within voids of prosperity. Medoere is a small little country in the middle of the southern coast. It was once a part of Diemed but it split off in a battle for independence that ended only eight years ago. Recently, Medoere's split was the result of the rise of a new religion. As magic returns to Cerilia, the patron deity of magic is growing in strength and he has chosen the provinces that make up Medoere as the home of his new church, the Celestial Spell of Ruornil. To the west of Medoere is Ilien, a trading nation and port city that thrives due to strong alliances with many coastal regions, and Roesone, a fiercely independent nation and strong ally to both Ilien and Medoere. This is where the war starts! The son of Baron Heirl Diem was visiting the capital city of Ilien when an assassin struck him with a poisoned dagger. The assassin surrendered to Ilienese authorities rather than be chased and killed and declared himself a loyal and free citizen of Medoere. To add further insult, he escaped from Ilien's jail less than a week later. The Baron of Diemed issued a list of demands to both Medoere and Ilien, chiefly among them was that Medoere would dissolve it's sovereignty back into Diemed rulership. The ruler of Medoere and Archpriest of the Celestial Spell, Suris Enlien, agreed to the terms of all of the demands except this first point. Diemed began it's invasion upon receiving the response. Tuornen was once part of Alamie, one of the mightiest countries in all of Anuire, but split off during a civil war less than a hundred years ago. The Duke of Alamie had an illegitimate son who claimed the throne for himself and the people in the west of Alamie supported this son, while the people in the east supported the rightful heir. This schism, fought mostly between the noble houses, caused Alamie to split in half. Noble houses crumbled, new nobles rose to power, and the wounds of this war are still felt in the rivalry between the two nations today. 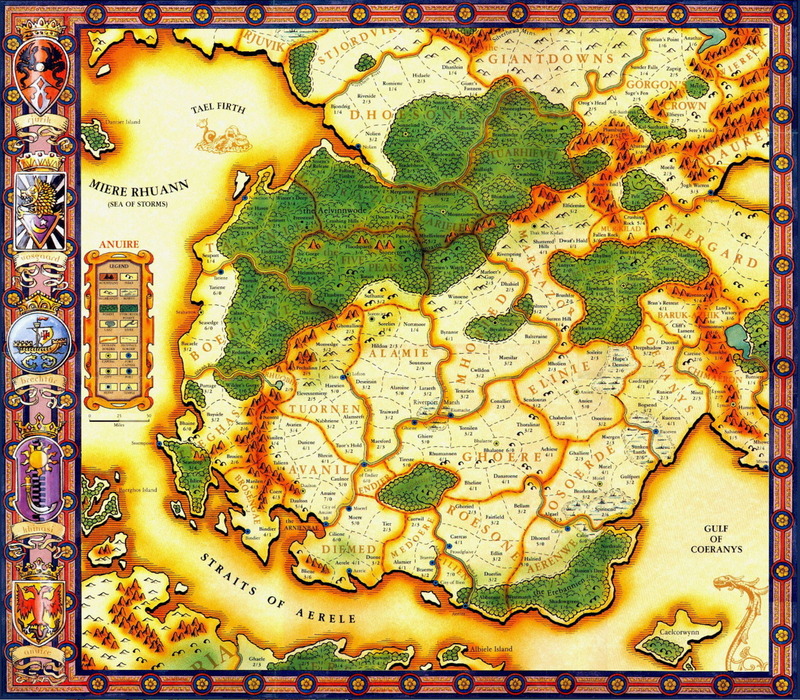 If you look at the map, you'll see the southern tip of Tuornen connects to the small country of Endier. Endier is a thriving trade capital, much like Ilien, but it relies on trade through the river and essentially acts as a safe haven around the Spiderfell. The countries of Tuornen, Ghoere and Diemed are all in a common trade agreement through Endier referred to as the Triple Alliance. While Diemed might be an economic ally to Tuornen, the personal goals of the Duchess are at odds with Baron Heirl Diem's warmongering. The war was started by an agent of Diemed, a shapeshifter who escaped Ilien's jail easily and is now headed into Avanil to assassinate somebody else. The ruler of Ghoere, Baron Gavin Tael, is responsible for giving Baron Heirl Diem the idea of getting rid of his son and starting a war with Medoere. Baron Tael wants all eyes on Diemed so that he can legitimately launch attacks into Endier and Roesone and expand his territory by taking over the trade city of Endier, the farmland of Roesone, and blockading Ilien. But Avanil is a strong ally of Roesone, so they will quickly come to Roesone's aid, even if they have to go through Diemed and fight Ghoeran troops to give it - which is why Baron Tael instructed Baron Diem to send his assassin into Avanil and disrupt the noble houses there. And this is only patterned after the first few months of World War One. The real world conflict lasted four years and was incredibly bloody and drawn out. Once the war starts I diverged from the events of World War One a bit. I take elements from the War of the Roses and the Hundred Years War to flesh out many of my Great War's turning points, but the beginning is rooted in World War One's conflict.